How can I add transparent background on this image instead of black background, but I also would like to keep the partial transparency effect on some of the particles and particles borders. Could you please share actions in either photoshop or gimp, thanks. Greenfish Icon Editor Pro has this functionality out of the box. It is a function called "Remove Matte", where you just specify the color component you want to be replaced with transparency. In your case black. GFIE Pro is a powerful icon, cursor, animation and icon library editor. Layer support with advanced selection handling makes it a really professional and unique freeware tool for designing small pixelgraphic images. GFIE offers high-quality filters like Bevel, Drop Shadow and Glow; supports editing animated cursors and managing icon libraries. It's lightweight (< 1.8 MB unzipped) and also has a portable version - just unpack it to your USB drive and use it anywhere. A clean, customizable, multilanguage user interface makes it really easy to learn and use. And just to be complete, here is the GIMP answer. This will require a little experimentation. As with most things in Photoshop, there are multiple ways to get there. Eyedropper a solid part of the red cloud to make it the foreground color. Choose Select > Color Range. Set your Selection Preview to "Grayscale" and the preview thumbnail to "Image" so you can see what you're doing. Uncheck "Localized Color Clusters". Adjust the "Fuzziness" slider until your grayscale preview matches the image thumbnail. Click OK. Copy the selection to a new layer using Layer > New Layer via Copy or the keyboard shortcut Ctl/Cmd-J. Iterate these steps using different fuzziness settings until you have what you want. Copy your image to a new layer. Optionally, place a layer below with the color you expect you'll be using in any final composite (e.g., a background color or image on a website) so you can see exactly what things will look like. 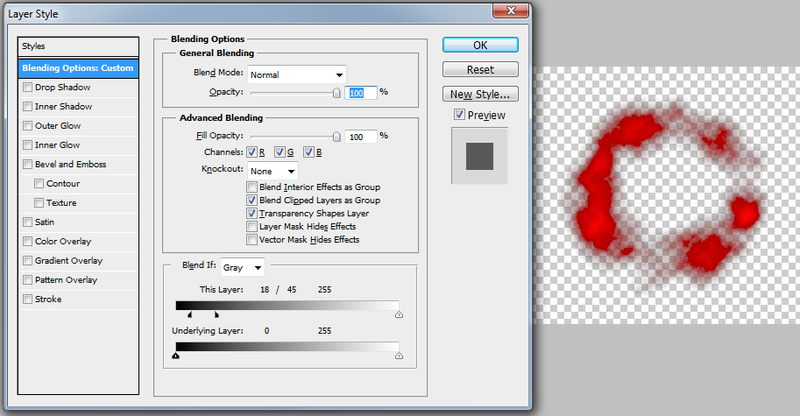 Double-click the new layer thumbnail to open the Blending Options dialog. The advantage of this second method is that it is entirely non-destructive, and you can fine tune as much as you like. Go to Channels window and click red channel while holdin Ctrl button to make selection out of it. Make sure youre back in rgb channel and go back to layers window. Copy the selection Ctrl+j and there you go. You could also invert slection and delete the background.. Works either way. Turn the image black and white. Invert colors Ctrl+I to make sure that the image you want to extract is now black andbackground white. Then go to Edit > New brush preset and make the image into a brush. If you get brush tool you can find this image as a brush in the brush list. Will add better explanations tomorrow when im on my pc. For this type of image I use the freeware "Eliminate Black" filter, followed by Remove Black Matte. Not the answer you're looking for? Browse other questions tagged adobe-photoshop gimp transparency background-removal or ask your own question. How to make an image with transparent text on an opaque background?